I love the allium family: onions, shallots, garlic, chives, scallions – all of them. I also love pickles, and pickled onions and shallots are, perhaps, amongst the very best of all. Today, when we talk about pickled onions, we are usually referring to small onions sitting in a jar of vinegar, but things haven’t always been that way. Pickling has been used for thousands of years to preserve food, and the earliest method was that of lacto-fermentation. Today, the most common lacto-fermented pickles that we see are sauerkraut and kimchi, but we can preserve all kinds of vegetables this way. I often pickle my own onions and shallots, and have always used vinegar in the past. With a recent batch, however, I decided to try lacto-fermentation instead. The process is extremely simple. Take a kilogram or two of small onions or shallots (I used shallots) and peel them (that’s the tedious part). Place them in jars and cover with a 5% brine solution, made with sea salt. (A 5% brine is made by dissolving 50g of salt in one litre of water). To each jar, I also added a few whole spices – coriander, allspice, black pepper, dried chilli. I then sealed the jars and put them in the pantry out of the way. After about a month, I opened one to see what was happening. The brine in the jar immediately erupted in a seething mass of bubbles, as though the liquid was boiling vigourously. Of course, lacto-fermentation produces carbon dioxide as a by-product, and this dissolved in the brine. Opening the jar released the pressure in a rather startling, but impressive, manner. It’s probably a good idea to release the pressure every now and then! So, I tried a shallot. The pickling process was clearly working – it was starting to develop the sour taste you would normally associate with a pickle – but it still had a rather raw flavour. I decided they needed more time. I resealed the jar and returned it to the pantry and forgot about them for a while. It was about three months later when I remembered the two jars of shallots lurking at the back of the shelf, and so I fished one out and tried again. This time, the shallot was utterly delicious. It was perfectly crunchy. It was sour and beautifully tangy. I’ve made and eaten very many pickles in my time, but this was probably one of the best I’ve ever tried. Now I’ve savoured the lacto-fermented version, I’m pretty sure I’ll never use vinegar again. A little while later, one of the jars is now empty and I’m about to start on the second one. I guess I should get on and make some more – if I start now, they should just about be ready for Christmas. Lovely! I was looking for a lacto fermented piccalilli and although this isn’t piccalilli, I’m hoping you’ve now done a piccalilli by the same method you’ve used so beautifully on your shallots. They’re stunning BTW. I never thought to leave them whole for fermenting (I have done it the sauerkraut style on onions). My childhood memories of piccalilli include: Onions, cauliflower, green or yellow tomatoes, Berlin or cucumber and/or the occasional other bit of produce. Plus spices… Think you might? I’d never thought of trying a lacto-fermented piccalilli, but have to admit the idea does sound quite tempting. I’ll give it a little thought. 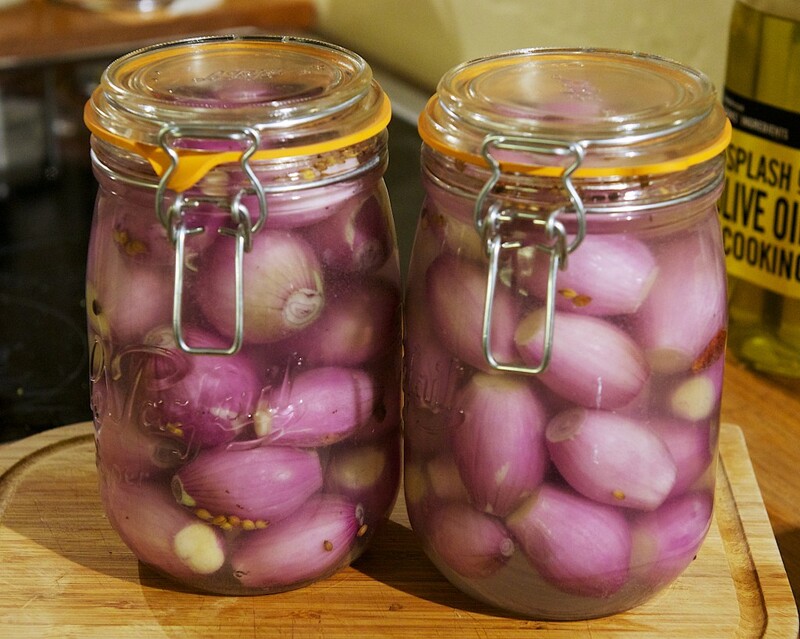 I really need to make some more pickled onions too – we’ve run out! Hello these sound lovely.Can I use my old regular jars or do I need special fermenting ones? Your regular jars should be just fine. Carbon dioxide is generated during the fermentation, so crack open the lids every now and then to release the pressure – the bubbles can be quite spectacular!